I really enjoyed the second Fireside chat featuring Anne Davis and Ewan McIntosh. I enjoyed the schoolroom style humour, but have to admit that I need to re-listen to the audio to have even the faintest chance of remembering what either keynoter said! I talked about the audience factor over at Mark Ahlness' blog - so, won't it be great in the future when we can all host our own fireside chats with the same talented folks participating in smaller groups? It's amazing that every time I make a poor turn of phrase, Sheryl has redirected my attention back to the positive. She had to do it again at Mark's blog. Thank you, Sheryl. "...although the format really placed most people in the role of audience"
Please know we so struggled with how to format in a way that honored the keynoters and presenters for their time and energy and still give everyone equal voice-- all in under an hour. We simply decided that the fireside chats would be like an "ice cream social" or edublogger "meet-up"-- allowing connections to be made and deepened but certainly not serving the purpose of deep reflection and profound solutions. I personally would adore the kinds of exploration of ideas and issues on an equal footing that Graham describes and have in various Skypecasts I have attended. In fact, we are hoping the 24 hour "When Night Falls" culminating event of the K12 Online Conference should be very much like what Graham is envisioning. There's been a lot of talk about the international flavour of the Conference - check the Frappr map that Darren sent during the first Fireside Chat. Won't it be great in the future when the busy cluster across the North American continent is replicated all over the rest of the world map? "...you need to find networks that already exist and join with them, find people that will challenge you, that would be meaningful for you, that are authentic for you..."
Won't it be great in the future when (a) the teachers in your staffroom know what you're talking about and (b) they want your help to submit their own presentation! - Won't it be great in the future when people have a solid understanding of the different education systems worldwide so that localised acronyms, initiatives and phrases don't cloud the information being shared? - Won't it be great in the future when the technology becomes so embedded, so interwoven and so easy for anyone to use that the K-12 presentations focus solely about learning and how to facilitate it successfully in any K-12 classroom anywhere in the world? I'm happy that I'm involved in this conference. There is an old cliché that rings true - if you aren't part of the solution, then you're part of the problem. 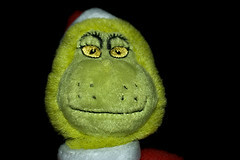 Time for the Grinch to start rephrasing his comments and blog posts, I think. Posted in Future Directions on October 30, 2006 by Graham. I like to think I got a handle on all of this Web 2.0 stuff via the process of immersion. Evening after evening, ignoring the banality of television, poking around on the laptop have given me skills and knowledge beyond the grasp of my staffroom colleagues. But could this occur to any teacher? Or is another essential ingredient needed for immersion to pay off? Back in July, Artichoke used a New Scientist quote about golfer Tiger Woods to comment on the idea of deliberate practice. I would also add that this particular person's success is a combination of immersion (as an infant, Woods would watch his father hit golf balls into a practice net in the garage from his high chair), deliberate practice and innate talent. I've been itching to pull a golf analogy into technology and education for a while and Bill has given me that excuse. The interesting thing about golf compared to other sports is the way ability or talent is measured - the use of the handicap system. Based on a person's scores, a handicap is calculated with the lower the figure, the better the golfer. I am an average but very keen golfer - 17 handicap - and before the kids came along, I used to spend several hours each week practising. Whether my style of doing things could be accurately categorised as deliberate practice is another argument but my handicap did dip to an all time best of 13 back in 1998 when I was playing every Saturday, playing nine holes after work on Thursdays and bashing balls on the practice fairway or chipping green on Mondays. My improvement could be directly related to my practice. What would happen if I was to be immersed in the game of golf? If I didn't have the distractions and responsibilities of work? How good could I become? A few years ago, Golf Australia did an experiment that trialled the golf immersion idea. They grabbed an average golfer - 20 handicap - and paid for him to have a year off to work on his golf game. They gave him customised equipment, provided scaffolded learning with the use of a golf coaching professional and required him to play a minimum of three times a week and to practice every work day. Over the course of a year, he did improve - he got to a handicap of 9, if I remember correctly - but it didn't look like going further than that. I think that his limitations in his ability would put a ceiling on his improvement, regardless of the immersion. Tiger Woods, possibly the most talented golfer ever, had all three factors for his success - immersion, deliberate practice and talent. I think in the business of learning, talent (or lack of) is often overlooked as an important factor. 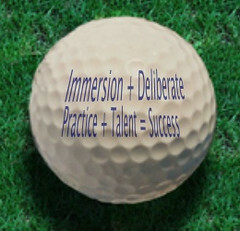 Immersion and deliberate practice can maximise that talent, however. I hope that my simplistic analogy is a useful adjunct to your thoughts, Bill. Keep 'em coming. Posted in Personal Reflections on October 28, 2006 by Graham. I'm not making any claims to furthering this person's education at all, although he was a member of the class I shared when I first lobbed at my current school. Andrew Campbell, a talented 16 year old Adelaide musician, has been noticed by talent scouts ahead of the annual ARIAS awards via a podcast published on AdelaideNow, an offshoot of News Corporation. I would not have discovered this except I was hunting for a link on recyclable can deposits in response to Tony Forster's latest post. Technology opens another door - this could really help sell Andrew's talents to the world. 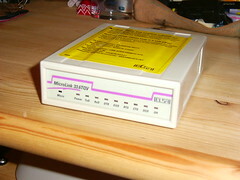 Posted in Future Directions, Internet on October 28, 2006 by Graham. Disclaimer: This post is a reflection on my experiences this morning at the K-12 Online Conference Week 1 Fireside Chat. It is not a criticism in any shape or form of any of the organisers, participants or the Elluminate environment. This is just my version, captured freshly for my own purposes. I was a bit late logging on, getting the Java flowing from within Firefox and then into the Elluminate environment itself. The participants were all listed in alphabetical order down the left hand side and you could hear the audio coming through nice and clear. Even after having a Skype chat the other evening with Sheryl Nussbaum-Beach, I was feeling uneasy about the possibility of speaking to the assembled crew. I found that keeping track of everything in the Elluminate environment wasn't an issue - although the chat box was a bit small - but soon became clear to me that having 34 people online at once wasn't going to produce any indepth form of discussion. I found it very similar to other social situations that I've experienced in f2f life. It felt like everyone else knew each other with a buzz of chatbox inside chatter and I was the outsider looking in, not sure where to start. Terry Freedman and Alan Levine were nice enough to personally greet me (I think Bud did too) and I didn't really start name-checking anyone else possibly due to my usual lack of self confidence in large group situations. I also felt that the conversation seemed to be skimming from one thing to another and it was hard to pick up who the different messages in the chatbox were directed to. I did get a whole stack of new skype names - that could well be the best part of the hour for me as it was a more direct conversation that would be of benefit to me. I'm not sure this could happen but a valuable twist on this concept could be breaking up a large group like this into smaller groups (4-6 people) to go to another virtual room and talk, maybe on a pre-identified topic. As my disclaimer, I am not criticising what was obviously extremely valuable for many of the attendees - I am trying to accurately describe my experience. As for the actual conference, I have to admit I am struggling to find the time to get into the assembled content. I listened to most of David Warlick's keynote and then the file corrupted and refused to play any more (it was good but Leigh's talk the other week was meatier and held my interest the whole way through) and then I checked out Alan Levine's excellent "I Did Not Know You Could Do That With Free Web Tools". The way he jumped from one technology to another across the web was brilliant and is exactly how our students operate. Again, heaps more to explore but at least I can say that I've attended his session in full. Also as the inverse to the question I posed on the whiteboard for Alan, there is much the K-12 sector can learn from the tertiary sector. What else have I checked out? Kathy Cassidy's presentation was also exceptional and a great example of how to keep things short and concise. I've checked out the first 20 minutes or so of Mark Wagner's blog presentation (one vowel away from being my brother's namesake) but I have to say a lot of the US based references and anecdotes had me lost. I watched most of Vicki Davis' wiki presentation - that was good but I left it a bit late at night to start watching it!! And now the other presentations keep piling up - I want to get into them but real life (and still keeping tabs on the rest of the online world) keeps interfering. I think that this is going to be continuing for me well beyond the conference endpoint - I still haven't finished checking out all the acculumated resources from the FNLW travelling unconference. Posted in Personal Reflections, Web 2.0 on October 27, 2006 by Graham. I've just spent the last three days at PLOTPD training with my principal ond our two new Assistant Principals for 2007. PLOT stands for Professional Learning Online Tool which lead some to the incorrect assumption that it was about technology. No, it wasn't and it may be a positive sign for the future that the technological aspect is embedded into the broader topic of leadership. I heard references to Marc Prensky, Ian Dukes, Daniel Pink and Thomas Friedman all in the context of our students' needs as 21st Century learners. There is a website however, called the PLOT tool, accessible by subscription but apart from perusing that as team, the three days were mainly engaged in conversation and discussion. PLOT training is capably led by David Anderson and Joan Dalton who structured a wide range of hands on activities and discussions that had everyone mixing and interacting regardless of their school position. This training is aimed at school leadership teams interested in establishing "communities of learning" within their own staff and school but the eight or so schools represented had their agendas to run as well. Ours was definitely an opportunity to meet together as a 2007 leadership team for the first time, get to know each other, establish some agreement about how to operate as a cohesive team and be "on the same page." It actually took until Monday afternoon before we even spent any time together because we were paired and then grouped semi-randomly in a series of activities. One activity had two of us interviewing each other about our respective schools on the topics of School Strengths, School Challenges and School Priorities. There was one other but I didn't take notes in the way I normally would in regular "transmission mode" training.Another activity on the second day had us matched up with new people again from other sites and this time, we shared significant changes during our lifetime. This sparked an interesting discussion amongst the group with three members talking about their perceived drop in social and educational standards, things were better in the past, kids of today are only self interested etc. I begged to differ without much success. I pointed out that the current generation are the most surveilled ever, parents tend to be on an overprotective high and that things weren't always so rosy in the past. When someone bemoaned the breakdown of the family unit, my mind wondered how many abused wives and children suffered under the moral silence of the day and passed these destructive behaviours onto the next generation. There was also extended conversation along the lines of, "Students of today expect everything to be fun. They have to learn that not all of education can be fun. Most of it has to be hard work because that's what life is like." I thought to myself that wasn't the case at all. I think students expect purpose and engagement as opposed to fun and it's not unreasonable for them to have that. I'd be worried that unimaginative or lazy teaching could easily hide behind such a philosophy or outlook. Anyway, the follow on to this discussion was the identifying of qualities, skills and aptitudes needed for the kids in our schools to succeed. Even my colleagues from my group helped to generate words like - flexible, can work in a team, savvy - even though the choice of self-discipline came across to me like veiled criticism of today's kids. Anyway, there were segments dealing with "tough conversations", norms and values with useful metaphors and anecdotes skillfully scattered throughout. David and Joan are extremely skillful facilitators and although I've run out of steam reflecting on these three days, there are many useful strategies, structures and protocols that I have gained and can use to improve my raw and emerging leadership skills. Research has consistently shown that all the things that schools can control, it is the quality of pedagogy that most directly and most powerfully affects the quality of learning outcomes that students demonstrate. Posted in Personal Reflections, Staff Training on October 27, 2006 by Graham. During this term, I have the pleasure of working with the Year 1/2 classes in our school as part of our Problem Based Learning program to develop an ICT product that showcases their learning. The problems are centred around Aboriginal Studies or animal environments (specifically desert and coastal) and the tools of choice for their final product are Powerpoint and PhotoStory. I just want to touch on the first lesson this week with the class tackling animals in desert environments and their foray with PhotoStory. Being young students (mainly seven and eight year olds) it is important to give them an opportunity to get to "know the software" in a safe, non-threatening way. I had to come up with a task that rehearsed the important components of PhotoStory so that when it comes to creating the knowledge product mid-term with the information gathered during research with the teacher-librarian, learning the software is not interfering with that process. So, here's what I did. I used the great Flickr CC tool created by Peter Shanks from Bathurst to quickly track down 10 Creative Commons licensed images of both cats and dogs. I downloaded them to a subfolder within the class folder on the network and showed the kids how to find them and insert them into the timeline in PhotoStory. They then had to add a title into the next text box and that's about as far as we got in one lesson. The whole idea is that the students produce a quick story based on risk free material so that they learn the skills without the content interfering. That way when they do their story based on what they have researched, learning the quirks of PhotoStory is already covered and not a distraction to that creative process! 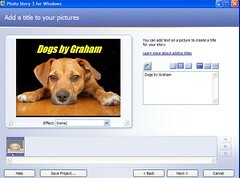 Posted in Problem Based Learning on October 24, 2006 by Graham. The fundamental outcome of most communication is misunderstanding. We also did another exercise where all participants had to chose a photo from a selection that said something about yourself. My first reaction was to not choose anything at all but then I found this image. 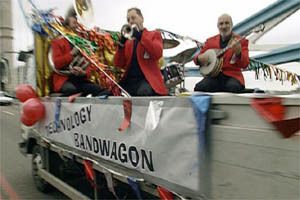 The Technology Bandwagon - in my professional setting, this is accurate because it seems to be leaving others behind, not everyone likes what they are hearing but those of us involved think it's pretty important. I can't post the image here because it's not CC but it was an interesting exercise. More later. Posted in Personal Reflections on October 23, 2006 by Graham. Ah, there's nothing like a little bit of controversy to make people sit up and pay attention. The two education events I'm following at the moment - the Global Summit and the K-12 Online Conference, have attracted some contentious feedback over the past few days that have challenged my (and I'm sure, quite a few others') thinking. Let's start at the Global Summit. There have been some dedicated edubloggers posting at regular intervals giving the aggregated masses their notes on the different speakers, some of the details behind their workshops and some starting points for their own processing. Here's what I'm not getting (and I'd love it if either Mike, Judy, Al or other onsite bloggers could take this up as a challenge when it is all over) and it's a real feel for how different (if it is) this event is compared to traditional conferences. How is it set up differently? What new opportunities are there for the participants? How does the networking take place? What sort of educators are there? How are they reacting to the ideas and concepts being presented to them? I enjoyed George Seimens presentation, but found nothing new to what is already discussed with vigour in the blogosphere. Yet for many delegates his thoughts were challenging, new and exciting. What this tells me is that there should have been a bigger grass-roots representation at the Global Summit - that our educator leaders should have encouraged their practitioners to attend. She felt entirely comfortable and the information was familiar - but for most of the audience, Siemens' concepts were relevatory. And while I appreciate the notes on each session, I can now skim over them because I can get a much better virtual front seat and instead download the audio, load up the accompanying images and be a networked part of the audience. I did this for Leigh Blackall's session - I timed his image stack to his talk. While listening, I thought that I could sense a touch of nervousness in his voice, possibly because he sensed his message would be confronting and unnerving for some of his audience. (Please note my artistic license here.) All I was missing was being actually face to face, reading his facial expression and body language for myself to confirm my impressions. Personally, I really enjoyed his presentation and found his ideas and content to be thought provoking and confirming of some of the things I've suspected about learning and education in general. Leigh talked about his regret for the high price of his education (twenty grand in HECS fees) and how now his learning is fuelled by the network. This resonates with me to a degree (no pun intended). I was lucky enough to get my tertiary education for nothing in the mid-80's but the government shifted the goal posts thereafter and so I've never gone back to build on my original qualification. So in a formal sense and by traditional standards, I guess that makes me undereducated but Leigh's model of Networked Learning really rings true for me. I vividly remember being roundly criticised by a then friend from my teachers' college days for not doing the extra year to upgrade to a B.Ed - I still feel embarrassed admitting it here. But life in the classroom seemed to be worlds away from the lectures, tutorials and essays of the tertiary institution. So I never went back - life seemed to keep throwing up reasons not to, although I have never stopped learning. Now, it is extremely unlikely that I ever will go back to a formal higher education institution unless some generous benefactor was to pick up the tab. So, maybe teaching is dead. In that case, even Leigh would have to agree that due to the slow pace of change in any school, there will be quite a few teaching zombies still going through their traditional motions for quite some time to come. What puzzles my mind is how Leigh's idea, could or will filter down to the secondary and primary schools of Australia. He made reference to Greg Whitby from NSW Catholic Education and the new school that is being developed in Sydney which attempts to redefine the secondary school experience. Things do have to change - of that there is no doubt in my mind - but from Leigh’s vision, how a new form of teaching can emerge post-secondary is a lot clearer because it means dealing with adults who are freer to make their own learning choices. How we deal with relevant learning for adolescents still moulding their own self identity and purpose in the world and the children of the primary sector who are focussed on acquiring the literacy and numeracy skills that will lead to skilled and informed choices is another question. Here in South Australia, we have a broadly worded Birth-12 curriculum designed to be evolutionary and keep pace. But I fear the exponential speed of information change and access is already rendering so much of those outcomes obsolete. Maybe it will take a wave of home schooling or the opening of access to distance learning materials (via places like the Open Access College here in Adelaide) for more students than just those who qualify presently due to isolation, medical circumstance or exclusion from the mainstream. I'm not sure - like all good presenters, Leigh poses as many questions as he proposes answers. I can see Leigh as an educational version of Douglas Rushkoff especially in his use of historical metaphors throughout his presentation. Interestingly, although Leigh has been variously described as vehement and as anarchic, I tend to think of him as more of an idealist. He still manages to keep the passion burning fiercely looking to push the boundaries of conventional thinking. I remember my tertiary education days when I grabbled with issues of social justice and I thought I could make the world a better place by training to be a teacher. Then the action and ethics that go with that idealism gradually leaked away and the passion got put on the backburner. In Leigh, I hear someone who has managed to keep the fires of his chosen idealism stoked and burning. I am constantly amazed at the ideas and new directions he gives freely through his various online avenues. There are so many of us in the edublogosphere who moan about the slow pace of change in all sectors of education. Why is it that Leigh's impatience and suggestions for reform are seen to be so radical? The other thing to keep in mind is that it is easy to judge Leigh's talk in isolation but his ideas and thoughts are all out in the open for anyone with the web connection and the inclination to check things out. To put his ideas into context requires reading his blog, his postings on TALO and FLNW, his free range array of presentations, video and screencast repositories but he's an open book. It's easier to criticise someone laying it all out, raw thoughts and all as opposed to the slicker, more moderate presenter from within the UK education system who I cannot find anything about on the web. I can find his bio on the educationau website but where do I find his resources, his raw thinking, his innovations. I know where to find Leigh’s. And it’s as easy as googling “leigh blackall”. Idealism is a quality Leigh shares with Stephen Downes, which is where the second bit of controversy lurks. Stephen’s take on the K-12 Online Conference drew a quickfire round of comments from people who took offence (I was one of them) but he elaborated more on his thinking on his personal blog and had me wishing I hadn’t been so hasty to react in his comments section. I had never considered what Stephen was pointing out and it really made me think (no mean feat in itself) about why I had wanted to participate, what others would be getting out of my efforts and after listening to part of a conversation between Bud Hunt and Dave Cormier about whether perpetrating an old model of conferences into an online format was really anything groundbreaking, whether just sticking to my blog might not have been a bad option. I do take heart that I’m not the only one to get swept away with a concept because there are seven trusting edubloggers who readily agreed to be part of my K-12 Conference presentation without batting an eyelid and went to great lengths to fulfil my request. What Stephen has done has made me aware that my trust in this concept should not be given away lightly. My ideas and resources, even those developed collaboratively, are beyond my control once given over to a larger event and not everyone operates in the open. I don’t know what anyone else’s motives for involvement are but I can see why Stephen is skeptical. So, at this stage, I’m uploading my webcast to the designated conference organizer and my wiki is at a stage I’m happy content and idea-wise with. But I’m back to questioning my own motivations and purposes. Will my own participation bring anything new to the table? Why do I feel like some of my own idealism has been sapped? Maybe, along with Teaching, it’s time for Conferences as we know them to be dead. Posted in Future Directions, Personal Reflections, Web 2.0 on October 21, 2006 by Graham. I was ready to record my bit this afternoon. I had the mic. I set up a new podomatic account and ran a test, like I mentioned in a message to you earlier today. Then the net went OFF at about 10 AM. Something happened to the fiber optic cable that connects the whole northern part of Alaska to the rest of the world. A railroad crew doing some maintenance, the story goes. We've been offline all day. Weird. It got me thinking as I emailed him back that maybe that access for this event (and many others) is a real issue for many educators who through no fault of their own, don't have broadband web access. There are still many areas in Australia where broadband is not available or prohibitively expensive so maybe we need to keep that in mind when we get all carried away with our screencasts, podcasts, webcasts and interactivity. Maybe the simple stuff like a blog or a wiki that is easy to access no matter the web connection speed have to be provided in equal availability. I can see why podcasting is not going to take off anywhere where it takes half an hour to download two minutes of audio. It means I will now put as much effort into my presentation wiki as the webcast - it may well be the only part that Doug and other educators on the digital fringes get to see. Flickr Image: Elsa Microlink by Tim Dan!el. Posted in Future Directions, Web 2.0 on October 17, 2006 by Graham. There's a heap of great thinkers and speakers lined up to be part of this thing - Seymour Papert, George Siemens etc. but I'd love to be there when Leigh Blackall rolls out his "Teaching Is Dead, Long Live Teaching" presentation. Anyway, there will be a few informal opportunities for those of us who won't be there in Sydney as Al has outlined in this post. I'll check a few out inbetween my first week back at work and working hard on getting my K-12 Online Conference presentation ready. I'll blog about my preparations soon but David Warlick's keynote should be ready for download later this evening. Posted in Future Directions on October 15, 2006 by Graham.